Plowing toward the US Virgin Islands and Puerto Rico, Category 5 Hurricane Maria has put locals on high alert after the powerful storm inflicted "mind-boggling" damage on the island of Dominica late Monday night. "This is going to impact all of Puerto Rico with a force and violence that we haven't seen for several generations," Puerto Rican Governor Ricardo Rosselló told AP Tuesday. "We're going to lose a lot of infrastructure in Puerto Rico." "We're going to have to rebuild," the governor added. 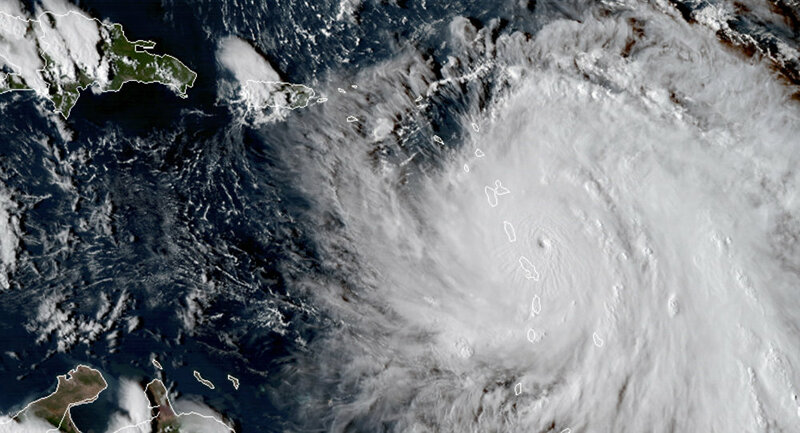 Gaining a tremendous amount of strength in a short period of time, Maria went from a minimal Category 1 storm to a Category 5 monster within 18 hours, a new record, according to Tomer Burg, an atmospheric graduate student at SUNY-Albany. ​The latest powerhouse storm in 2017, officials speculate Maria will strike Puerto Rico and the US Virgin Islands between Tuesday night and Wednesday where it will likely cause a "potentially catastrophic" combination of 160 mph winds, coastal inundation from storm surges, and dramatic rainfall. ​"On the forecast track, [Maria] would be the most destructive hurricane in Puerto Rico history," Eric Blake, a forecaster at the Hurricane Center, tweeted Tuesday. "Very sobering year." ​According to the National Weather Service, due to Maria's slow movement's it will likely drop anywhere from 12 to 18 inches of rain on the Island of Enchantment and the US Virgin Islands — with some isolated totals to exceed 25 inches. As of 11 a.m. Tuesday, the service painted a dark picture for the island, suggesting the storm's floodwaters would make structures "uninhabitable" as local streets and parking areas turn into "rivers of raging water." ​Heeding the doomsday warnings, residents have begun stocking up on food and water as many others prepared to hunker down in shelters ahead of Maria's expected landfall. ​Hector Pesquera, Puerto Rico's public safety commissioner, told AP that residents living in "flimsy homes…have to evacuate. Otherwise, you're going to die." Deemed "an unprecedented atmospheric system" by Rosselló, the 38-year-old politician urged locals to take the proper precautions as emergency workers "will not be available to help you once the winds reach 50mph." ​Maria, the first Category 5 to strike Puerto Rico in 85 years, has already demonstrated its power after barreling through Dominica. ​"So far we have lost all what money can buy and replace," Roosevelt Skerrit, the prime minster of the island nation, said in a Facebook post Tuesday. The head of government later added that his greatest fear was "news of serious physical injury and possible deaths as a result of likely landslides triggers by persistent rains." The Caribbean island was "devastated" by Hurricane Maria as the unrelenting cyclone tore it apart with destructive winds. ​According to the National Hurricane Center, Maria is roughly 185 miles southeast of San Juan, Puerto Rico, with sustained winds of 165 mph. Hurricane warnings have been issued for Puerto Rico, Vieques, and Culebra. A tropical storm watch was issued for the west of Puerto Plata. Once Maria finishes its stay in Puerto Rico, the traveling cyclone will head to the Dominican Republic, however, the hurricane is later expected to zero in on the Turks and Caicos and southeast Bahamas — all areas previously hit by Hurricane Irma.